Renowned health professional and author of ‘Healthy Healing’s Detoxification’ Linda Page aptly describes body detoxification as a ‘spring cleaning’ ritual to arouse the body from its sluggish state, and encourage a more active lifestyle. The food we consume, the water we drink, even the atmosphere around us is charged with toxins. Furthermore, over-the-counter hazardous chemicals like bleach and various other cleaning solvents that are used worldwide emit gases, which when inhaled by humans are extremely harmful to the eyes, skin and even the respiratory tract. Moreover, bleach, when mixed with other cleaning solvents turns poisonous and leads to headaches, bleeding nose and other neurological disorders. A 2014 study published in the PLOS Computational Biology journal noted that environmental toxins in the body could harm the fetus and lead to autism and various other intellectual disability disorders. Some common symptoms of a toxic body may include sluggishness, bloating, fatigue, puffy eyes, mental incertitude and infections. However, your body naturally eliminates toxins to avoid heath problems and this process is called – detoxification. Carried out mainly by the liver and the gall bladder, the process of detoxification is all about resting, cleansing and nourishing the body from the inside out. All in one, detoxification protects your body from a plethora of diseases and ultimately promotes your optimal health. 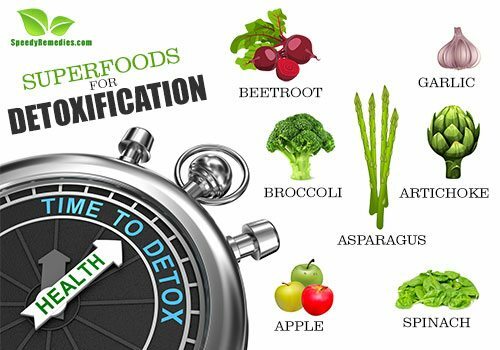 And all you need to do towards proper detoxification of your body is – dump detox super-foods into your diet. These foods will then assist your liver in eliminating the harmful toxins and flushing them out from your body, thus keeping it healthy and clean. According to a 2007 study published in the Nutrition journal, beets contain betaine and polyphenols, compounds that increase the formation of glutathione (antioxidant) and superoxide dismutase (free-radical eliminating enzyme) in the liver. Both these substances support the detoxification system of the body. Beetroot is a valuable source of essential minerals like iron, potassium, magnesium, phosphorus, zinc and calcium, vitamins like A, B and C and fiber and folic acid, all of the essentials for optimal detoxification and elimination of waste. The vitamins and minerals in beetroot further help in protecting the liver, cleansing the body and stabilizing the blood’s acid-alkaline balance (pH), which in turn leads to healthy detoxification. According to a study conducted by researchers at the University of Debrecen, Hungary, beta-carotene and vitamin A activate a chemical called PXR that in turn produces the biochemical responsible for eliminating toxins from our bodies. Beets also support the gall bladder and liver in breaking down toxins. Furthermore, the fiber content in beets attaches itself to any unwanted toxin in the body and flushes it out. You can consume beetroot raw in a salad form or extract the juice out of it. Wash, peel and chop 3 raw beetroots into long and thin slices. Heat 3 tablespoons of olive oil in a pan. Fry the chopped chunks of beet for 2 minutes. Garnish with 1 tablespoon of honey and grainy mustard each, mix together and enjoy! Note: Beetroot is high in oxalates, so, do not consume beetroot if you have kidney stones or are prone to the trouble. Garlic contains sulfur, a compound that attracts heavy metals (lead, mercury, aluminum) from the body, causing them to unfasten from soft tissues and cling to the sulfur instead. This helps in fighting harmful bacteria and yeast from the intestines, flushing them out at one go. Garlic also aids the detoxification process by stimulating the production of glutathione, a compound that helps filter toxins from the digestive system. Moreover, garlic is rich in vitamin C which further helps in boosting your immunity and ensuring optimal functioning of the liver. A study published in the journal “Basic & Clinical Pharmacology & Toxicology” in 2012 proved that garlic is as effective as D-penicillamine (drug used for eliminating heavy metals) and much safer than it, too. The research observed that garlic showed amazing results in reducing blood-lead concentration in the body. Chop, peel and consume 2 to 3 cloves of a medium sized garlic. Since raw garlic can be too pungent, mince some parsley with the garlic. In case the smell irritates you, eat some flavored yoghurt or cardamom to do away with the bad breath. Note: Upon cooking, garlic loses some of its sulfur content, and therefore, is best when consumed raw. Asparagus contains asparagines, an amino acid that acts as a natural diuretic to aid the passing of urine from the body. Diuretic drugs cause excessive urination in the body thus flushing your system of metabolic wastes and toxins. Moreover, they aid in the elimination of too much sodium and electrolyte content in our body, the excess of which can lead to nausea, dizziness, diarrhea and blood pressure troubles. A 2009 study published in the Journal of Food Science concluded that asparagus helped in the protection of liver cells against toxic insults. Owing to its diuretic function, asparagus helps in maintaining the balance of water in organs and cells, purifies your blood, and rids your skin of excess cellulite, reducing eczema and acne. Furthermore, asparagus contains glutathione, a carrier antioxidant that helps in deactivating liver toxins leading them out for elimination. Grab 8 to 10 large asparagus spears, 1 medium cucumber, 2 celery ribs, 1 small lemon (peeled), 1 lime (peeled), 1 green apple (optional) and 1 cup of cilantro. Extract the juice of all the ingredients together in a bowl. The recipe makes around 16 ounces of asparagus juice. Consume 1/4th glass of this juice daily. Note: Those suffering from kidney inflammation must consult their doctor before consuming this drink as it can cause pain and irritation. Artichokes are an incredible source of various antioxidants, vitamins and minerals that make it a preferred choice of food for proper cleansing of your system. They contain cynarine, a chemical that aids in the production of bile in the liver, thus accelerating the elimination process for the toxins. Artichokes also contain silymarin, a flavonoid that aids in the protection of liver cells and cell membranes. Artichokes are rich in dietary fibers that attach themselves to the toxins and unused hormones in the body and carry these along out of the body. They offer amazing protecting properties by obstructing the toxins from re-circulating between the liver and the gastrointestinal tract. Artichokes are a rich source of vitamins C and K, antioxidants (caffeic acid, gallic acid, lutein, ferulic acid, tuin and beta carotene), minerals (manganese, calcium, potassium, iron, phosphorous and copper) and folic acid. Artichokes also help in protecting your system against liver toxicity (hepatotoxicity) and the detrimental effects of alcohol, processed foods and other pollutants. They contain natural diuretic properties, that aid in digestion and help in lowering bad cholesterol from the body. According to a 2014 study published in the Cancer Prevention journal, broccoli helped in decreasing the risk of airborne diseases in the body. 291 participants of China’s He-He Township, Qidong – a rural locality where air pollutants are in the excess, often leading to lung cancer and other chronic lung ailments, were put under a 12-week trial. The participants consumed a daily dose of a broccoli sprout drink. After 12 weeks, researchers noted that participants on the broccoli beverage reported significantly decreased levels of airborne toxins in the body. Broccoli, a cruciferous vegetable, creates enzymes in the body that help in deactivating toxins from the liver. These enzymes then attach the toxins to carrier antioxidant for final elimination. The fiber obtained from broccoli absorbs the toxins transferred to intestines by the liver. Furthermore, broccoli contains three nutrients – lucoraphanin, gluconasturtiin and glucobrassicin – that aid the liver’s detoxification process. It also contains a substance called suforaphane that is responsible for activating toxin-neutralizing enzymes during the process. Broccoli can be enjoyed sautéed, steamed or boiled. You can also add the florets to your favorite salads and soups. Sauté 1 chopped onion and 2 cloves of garlic (finely minced) until the onion turns translucent. Add 6 to 8 cups of vegetable stock (organic) and 2 pounds of chopped broccoli to the onions. Season with 1 teaspoon of grounded thyme and a pinch of salt and pepper (As per taste). Bring the mixture to a boil, simmer and cover with a lid for 30 minutes. Serve hot fresh parsley. You can puree the soup if you like. Apples are a rich source of pectin (soluble fiber) and cellulose (insoluble fiber) that serve incredible purpose in the detoxification process of your system. While pectin helps in preventing the buildup of plaque in blood vessels, cellulose, the insoluble fiber, adds bulk to the waste and assists the digestive system in quick movement of the waste through the intestinal tract. According to a 2008 study published in the Alternative Therapies in Health and Medicine journal, apples are a great contributor towards reducing lead levels in your body. The study was conducted on children with significant amount of lead in their blood, and who had not been given any detoxification for the past three months. For a cycle of 28 days, the children were put on a dose of 15gm of citrus pectin, administered thrice daily. The final results of the study showed a considerable reduction of lead in the blood serum. Apples are also a natural source of glucaric acid that helps fix progesterone deficiency (also called estrogen dominance) and destroys toxins received through artificial additives in food. Apples also contain phlorizidin (plant metabolites) that enhance the production of bile in the live. The increased production of bile in the liver leads to increased toxin-elimination through stool from the body. 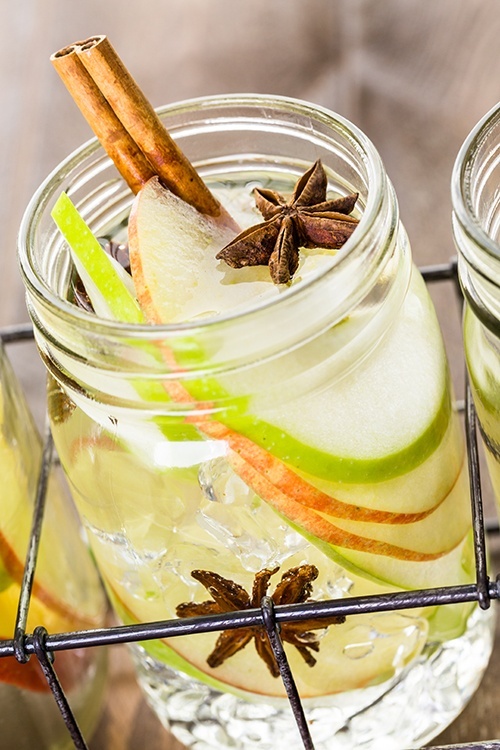 Infused apple water with cinnamon. Take water in a jar. Add a few slices of apple in the water. Add 2 to 3 sticks of cinnamon. Keep aside for 2 hours and then drink. Note: People suffering from chronic degenerative diseases such tuberculosis or cancer, nursing mothers, and children must consult a doctor before adopting any kind of rigorous detoxing regime. Spinach, the green veggie is loaded with fibers and antioxidants that have an alkalizing effect on the body. This helps in fighting bad bacteria, yeast and in sucking up environmental toxins from the blood. With its content of fibers and antioxidants, spinach stimulates the detoxification process of your system by speeding up the elimination of toxins from blood. Moreover, spinach contains phyto-nutrients that help in detoxification by supporting your liver function and preventing bacterial overgrowth in the gut microflora. It is best to consume the vegetable in its raw state, as it loses its nutrients when cooked. It contains a whopping 166 milligrams of glutathione per serving when eaten raw. Cook it and it’s all gone. Place 1 cup of spinach leaves in a blender. Add 1 or 2 ginger pieces, 1 cup of brewed and chilled green tea, coconut water, pineapple chunks and chopped green apple each. Add ½ cucumber, cut into pieces. In case of an organic cucumber, do not peel away the skin. Add 2 teaspoons of honey, 1 tablespoon of lemon juice and 6 to 8 fresh leaves of mint. Blend all the ingredients together and enjoy your smoothie. Nutrition: Liver-protecting effects of table beet (Beta vulgaris var. rubra) during ischemia-reperfusion. Journal of Food Science: Effects of Asparagus officinalis extracts on liver cell toxicity and ethanol metabolism. Alternative Therapies in Health and Medicine: The role of modified citrus pectin as an effective chelator of lead in children hospitalized with toxic lead levels.